Simon here from Danza Loca with the latest updates. Introduce a friend to ANY Danza Loca classes (Zumba, Salsa, Bokwa, Bachata or WHATEVER! ), and we’ll give you both 50% off their first class! This offer is to benefit current students who bring “new” students to our classes. The new student will need to register as your guest (at class reception) on their first session. Bring more than one guest, and we’ll give you a class discount voucher (50% of course!) for each one, that you can use at a later date. The system will work much easier if the “host” accompanies their guest at their registration. Yes, once your friend has joined, they will also be able to benefit from this offer and bring their own guests to Danza Loca classes. We know dancing with the Danza Loca Crew has made a difference in your life. Wouldn’t you want your friends to enjoy the same awesome benefits you’ve been receiving since you joined? Things are hotting up in the tropics! We have confirmed our awesome Cuban instructors, Damaris and Ernesto, and also the Bali dance crew who’ll be joining us. Airfare prices are slowly increasing so booking now will save you money! 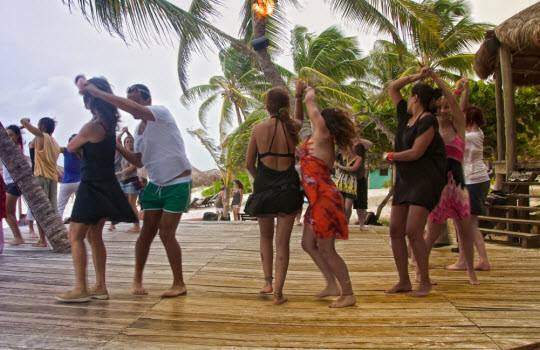 It’s an awesome, luxurious, weekend Salsa experience, at an amazing price. Has moved (last week) to Friday evenings 8-9pm, at our headquarters, 107 Alma Rd, North Perth. This class is limited to 6 participants, so bookings are preferred on 0402 092 900. Saturday mornings at ROYAL PARK HALLfrom 9-10am, (following our popular 8am ZUMBA® class). Starts August 3rd! Extra happy to bring Bokwa Fitness back to the city. You guys have been missing out for too long..
Don’t let the cold keep you from having fun or achieving your goals! Date confirmed for November 9th! Put it in your diary NOW! Hey guys if you haven’t “liked” our new Facebook pages yet, get on board at https://www.facebook.com/SalsawithDanzaLoca or https://www.facebook.com/ZumbawithDanzaLoca. We also have a BRAND NEW Twitter account @danzaloca. Tweet us a #hello! While I’m here let me remind you it’s STILL not too late to join our Danza Rama performance teams! For more info on classes, events or private instruction, Contact us. Also be sure to LIKE us on Facebook, “Salsa with Danza Loca” or “ZUMBA with Danza Loca” or follow us on twitter, @danzaloca to get all the latest info before the newsletter or the website.